RayBio® EIA kits utilize the principle of Competitive Enzyme Immunoassay, in which the target protein and a biotin-conjugated peptide bind competitively to a capture antibody. This assay requires only a single antibody, generating signal output by interaction of the biotinylated competitor with streptavidin-HRP. Thus, the EIA kits are particularly useful for detecting peptide hormones and other molecules for which no antibody pair exists, or for which antibody pairs cannot be developed. Another important advantage of the EIA format is broad-species reactivity. For each kit, a peptide derived from a high-homology region of the target protein sequence serves as both the standard and the biotin-labeled competitor. 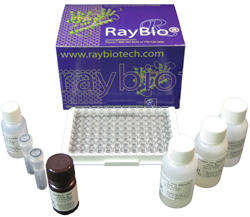 RayBio® EIA kits are validated for rat, mouse, and human samples and have expected reactivity with many other species. The samples and standards, which are spiked with biotinylated peptide, are pipetted into the assay plate; the target protein and the labeled peptide interact competitively with the capture antibody. After washing, the bound biotin-peptide then interacts with streptavidin-HRP, producing a color development reaction. The intensity of colorimetric signal is directly proportional to the amount of biotin-peptide and inversely proportional to the amount of target protein in the samples.